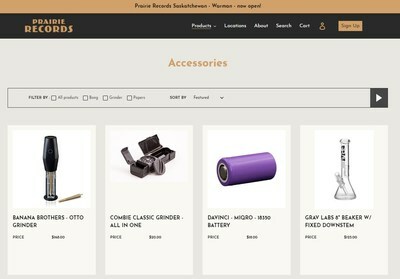 CALGARY, April 1, 2019 /PRNewswire/ - Westleaf Inc. (TSX-V:WL)(OTCQB: WSLFF) ("Westleaf"), is pleased to announce it has launched its e-commerce site for sales across the entire province of Saskatchewan. 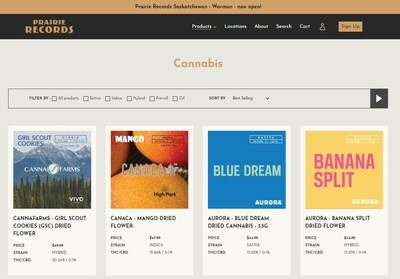 The retail site at www.prairierecords.ca, provides consumers in the province convenient online access to a wide variety of products through the unique Prairie Records retail concept, which combines music and cannabis in an engaging online experience. "The launch of online retail is an important next step in rolling out the Prairie Records brand across Saskatchewan and the rest of Western Canada over the coming months," said Scott Hurd, President and CEO of Westleaf. "The province of Saskatchewan has proven to be a positive regulatory environment to launch our retail operations and we are pleased it is the first jurisdiction with a Prairie Records online presence." Additional Retail - Westleaf holds the option to purchase two more stores in Saskatoon, which are scheduled to be open by April 20th. "By extending the Prairie Records brand across Saskatchewan, we will continue to build awareness around the unique retail experience both in store and online, which we believe will help build a strong customer base," said Adam Coates, Chief Commercial Officer at Westleaf. Focusing exclusively on densely populated neighborhoods, high traffic areas, and tourist destinations, Prairie Records retail stores will be situated in some of the most premium retail locations across the country. The foundation of the retail concept is ingrained with a desire to create a unique cannabis purchasing experience through tactile in-store features and product offerings that celebrate the relationship between music and cannabis. Featuring a rollout of up to of 50 retail locations in markets across Western Canada. Westleaf continues to be committed to becoming a leader in the cannabis retail market in Canada. This news release contains "forward-looking information" and "forward-looking statements" (collectively, "forward-looking statements") within the meaning of the applicable Canadian securities legislation. All statements, other than statements of historical fact, are forward-looking statements and are based on expectations, estimates and projections as at the date of this news release. Any statement that involves discussions with respect to predictions, expectations, beliefs, plans, projections, objectives, assumptions, future events or performance (often but not always using phrases such as "expects", or "does not expect", "is expected", "anticipates" or "does not anticipate", "plans", "budget", "scheduled", "forecasts", "estimates", "believes" or "intends" or variations of such words and phrases or stating that certain actions, events or results "may" or "could", "would", "might" or "will" be taken to occur or be achieved) are not statements of historical fact and may be forward-looking statements. This news release, forward-looking statements relate, among other things, to: (i) rollout of retail locations, including timing and opening of three retail locations in Saskatchewan; (ii) timing and completion of Westleaf's production facilities; (iii) receipt of regulatory approval for the purchase and transfer of the Saskatchewan retail locations; (iv) rollout of national online sales; (v) timing of delivery expectations; and (vi) the business and operations of Westleaf. Forward-looking statements are necessarily based upon a number of estimates and assumptions that, while considered reasonable, are subject to known and unknown risks, uncertainties, and other factors which may cause the actual results and future events to differ materially from those expressed or implied by such forward-looking statements. Such factors include, but are not limited to: satisfaction of all conditions to the exercise of the option agreements; receipt of approval of the permit application from the SLGA as well as approval from the SLGA for the purchase and transfer of the Saskatchewan retail locations; receipt of retail licenses from regulatory bodies and the lifting or loosening of the moratorium on new cannabis retail licenses in Alberta; timing and completion of construction of retail locations; review of facilities by Health Canada and receipt of a license from Health Canada in respect of Westleaf's production facilities; general business, economic, competitive, political and social uncertainties; and the delay or failure to receive board, shareholder, court or regulatory approvals. There can be no assurance that such statements will prove to be accurate, as actual results and future events could differ materially from those anticipated in such statements. Accordingly, readers should not place undue reliance on the forward-looking statements and information contained in this news release. Except as required by law, Westleaf assume no obligation to update the forward-looking statements of beliefs, opinions, projections, or other factors, should they change, except as required by law.